As a school librarian, I know that it makes sense to teach multimedia literacy skills collaboratively with the classroom teacher rather than in isolation. So I have been very lucky to collaborate with my colleague, Lisa Ross, 3rd-grade classroom teacher. Lisa decided to introduce her class of 14 students to the Amazon rainforest. After reading and discussing a lot of books about the rainforest, we prompted the students to think about what they still wanted to learn. In pairs, students brainstormed I Wonder… questions. 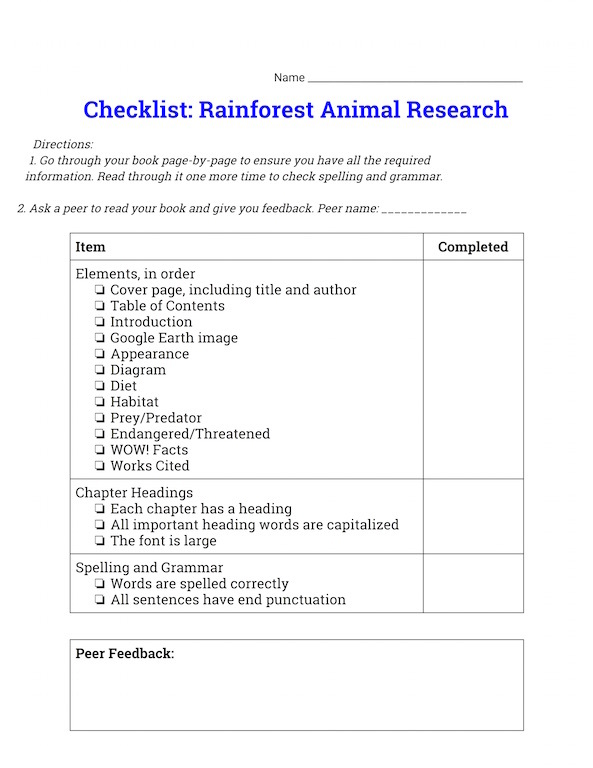 Questions about the different animals of the rainforest dominated and so we decided to engage students in a research project about an animal native to the Amazon rainforest. My goals for this project were to guide students through the research process, including using digital and print information tools, reading for information, note taking, citing sources, and then sharing their new understandings by creating digital books. In the course of this project, students developed multiple crucial literacy skills, including information, digital, visual, and textual literacies. As even adult learners soon find out, mastering a new web application or computer program requires first learning its basic and more sophisticated elements. Socializing students to these new forms of literacy is essential for their success. The students’ I Wonder… questions served as an excellent starting point to begin our research. 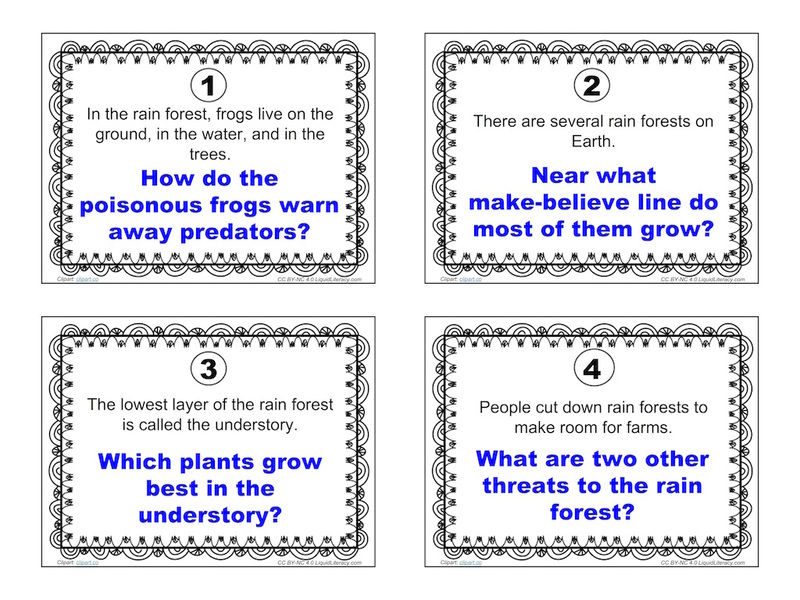 Using the questions, I created task cards, which students used to scour the “rain forest” article in the World Book Online Kids database for answers. 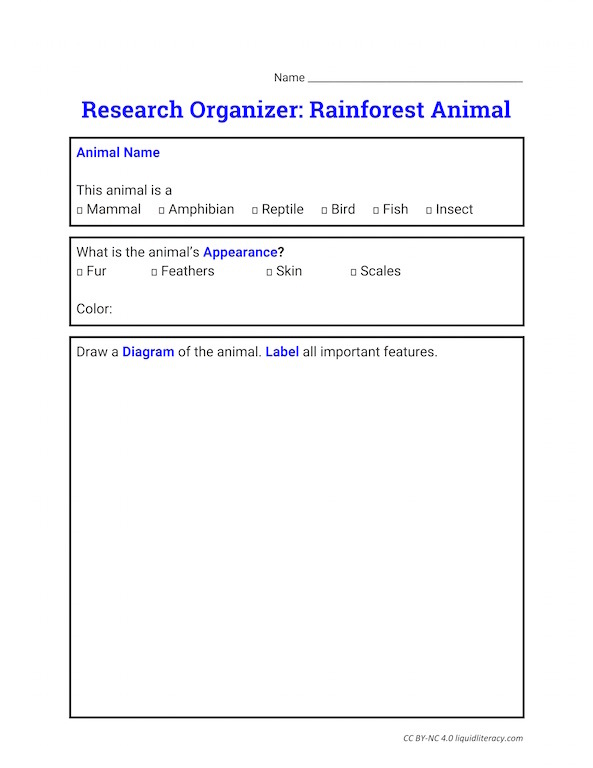 This allowed me to talk about database article text features (headings, sidebars, images), source citations, and to introduce the search command (command F) and it allowed to kids to gain more background knowledge about the rainforest while increasing their fluency with this digital information tool. During the next session, students chose an animal. I presented a list of animals and asked each student to choose one. While there was nothing wrong with this method, next time I will also show images of the animals and perhaps present one or two interesting facts. As it turned out, students chose animals that were seemingly more familiar, like jaguar, anacondas, macaws, and river dolphins rather than choosing a capybara or quetzal, for example. 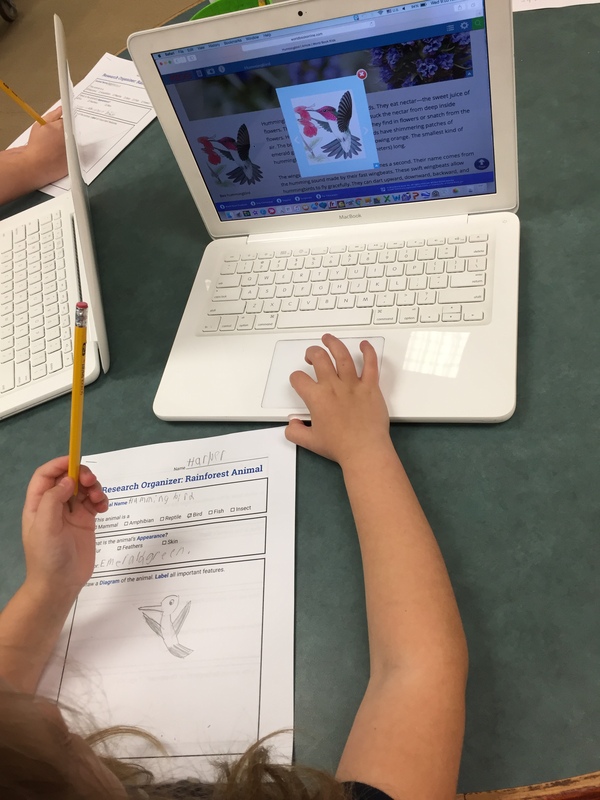 Students then went back to searching World Book Online, but this time for information about their chosen animal. To aid students in the research process, I created a graphic organizer for note taking. We then moved on to another database, Kids Infobits. This time, each student printed the article they found and then highlighted important information before adding it to their organizers with the idea in mind to teach them different ways of reading for information. During a third lesson, students read books for information–a perfect time to review nonfiction text features. Finally, we spent a couple of lessons on searching the Web. We used the kiddle.co search engine, which is powered by Google Safe Search and is more visual than a regular search engine. The first three search results are written specifically for kids and hand picked and checked by Kiddle editors. A quick check of information tool preference at the conclusion of the last lesson resulted in an overwhelming win for the web as the tool of choice. I can only suspect that this is due to the fact that the website articles tended to include unique information as well as more images than the often shorter database articles. As students read each source for information, they added new learning to the organizers and cited each source in an adapted MLA style. Even though the kids expressed a lot of excitement at some of the new facts they discovered, they also at times voiced a level of frustration with a process that required critical thinking and reading nonfiction consisting of often challenging vocabulary. We’ve all been there. But not one student complained or was frustrated during our creation stage. In order to share their new learning, I wanted the kids to create digital books using the Book Creator app, which is extremely user-friendly and versatile. The content requirements were simple: each section of the organizer is a separate heading/chapter in the book. Since the students had to include a diagram of the animal complete with labels, I introduced them to the PhotosForClass website, which provides access to Creative Commons images and, more importantly, automatically adds a complete citation. The students then imported the images into the Popplet app in order to add labels. I was particularly happy with a student’s work who not only added labels stating the parts of the animal but also explaining their purpose. To gain a better understanding of the Amazon rainforest in geographic terms, we visited Google Earth during another lesson and virtually traveled from our school to the rainforest. After exploring, students saved an image of the South American continent clearly showing the dark green area as well as the deforested areas of the rainforest. Both the diagram and the Google Earth image were imported into Book Creator. Students added text as well as illustrations using the app’s built-in drawing tool. They added a Table of Contents and a List of Sources and ensured each section had a heading. Lastly, they worked with a peer to review their work and then audio recorded themselves narrating their books. As I’ve observed so many times previously, students love to work with digital tools that allow them to be creative. 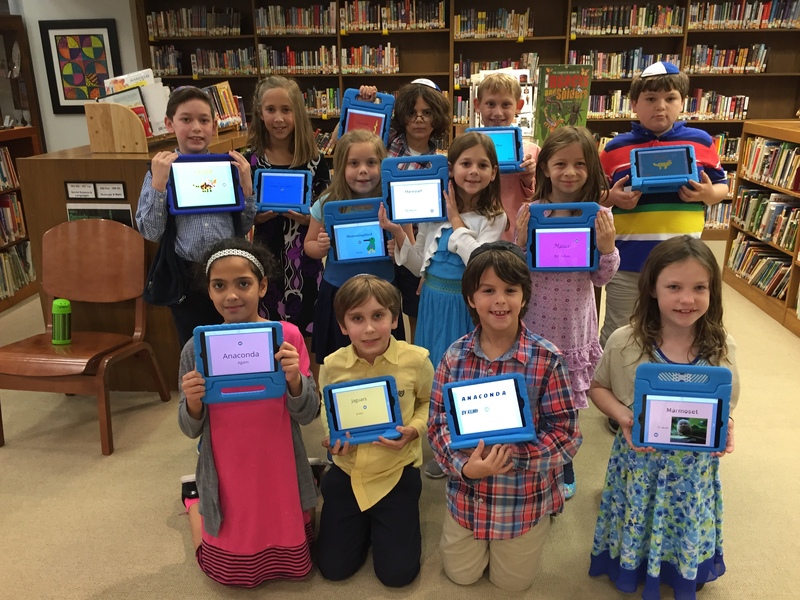 Not only did they explore new tools, but they also increased their fluency with this particular app while creating unique and individual products to share their new learning. Below are some examples of the students’ work, but please visit their blogs (see sidebar for links) to view them all. I made a book on macaws. First I researched in books, websites, and databases. Second I took notes in my organizer. Third I used the app Google Earth to take a picture of South America. I took a picture of South America because the Rainforest is in South America and my animal the macaw lives in the rainforest. 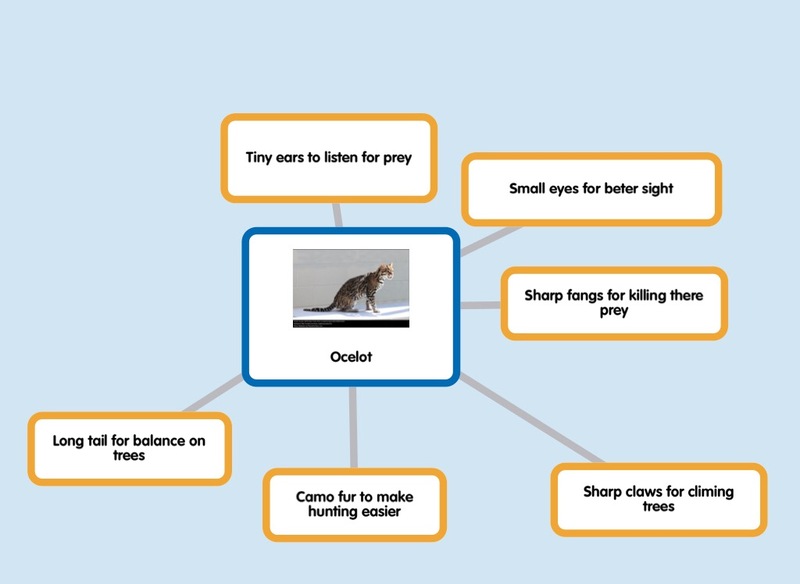 Fourth I used the app Popplet to make a diagram of the macaw. The diagram shows you parts of the macaw. Fifth I put it all together to make a book. I drew pictures, added a introduction, and added a table of contents. Finally I changed the fount of my words and changed the background color and recorded. Next time I will try to work on my spelling and maybe add more pictures. I will work on my recording also. I think I did a good job and I hope you liked the book. I researched on the marmoset and made a book. I researched in books and database and websites. I took notes in my organizer, I went on Google Earth to take a picture of South America where the rainforest is . I also went on Popplet to make a diagram of the marmoset. I got a photo of the marmoset on photosforclass .com. I went on the Book Creator App to make a book. On the app I added a table of contents, a list of sources, made sure I had headings, and drew pictures. I feel like I did a good job but I also think I would have thought to make more and better pictures. I would also do a better job at taking some more time. I felt like I did a good job at spelling and I also felt good about my recording but I wish it was a little more quiet in the background.